Within the past four months since my last post, our esteemed HistGeogUni member Peter Meusburger was unfortunately diagnosed with cancer and very sadly passed away in Heidelberg on 18 December 2017. Yesterday, family and friends as well as pupils, colleagues and dignitaries spanning the five decades since the award of his PhD at the University of Innsbruck in 1968 arrived not only from the wider region but also from as far away as Tokyo to pay their respect and say farewell to Peter in a funeral service that honored his expertise, humor and serenity, his academic legacy and, perhaps most importantly, his humanity in very appropriate and often moving ways. I first met Peter in April 1993, when he taught a Proseminar Anthropogeographie [second year seminar on human geography] at Heidelberg University, where he served as the Chair in Economic and Social Geography from 1983 to 2007 and continued to be employed after his retirement as Germany’s first Distinguished Senior Professor from 2007 until his untimely death in 2017. As a result of his seminar, Peter asked fellow student Tim Freytag (also a HistGeogUni member) and me to work with him as student assistants once he would have returned from a sabbatical year at Clark University in 1993-94 and we would have passed our intermediate exams. A joint visit to the Biannual Meeting of German Geographers in Bochum in October 1993 was followed by our research and teaching assistance as wissenschaftliche Hiwis from 1995 to 1997. Subsequently, Peter served as both Tim’s and my PhD supervisor, mentor and collaborator up until December 2017. Peter taught me about the geographies of knowledge and education, and suggested my PhD topic on academic mobility to Germany, a research trajectory that has eventually led to the foundation of this research network. Peter was not only one of the pioneers of studying the geographies of knowledge and education in Germany and on an international level, but he has shaped historical geographical research on the geographies of the university by publishing about the regional and social origins of professors at Heidelberg University between 1850 and 1932 (Meusburger 1990) and about periods of academic and financial prosperity and crisis at Heidelberg University from 1803 to 1932 (Meusburger & Schuch 2010). the introduction; relations between town and gown (both single-authored); the regional provenance and social background of professors 1803 to 1932; American students up to 1914; Hungarian students up to 1919; the student body 1803 to 1945; professors 1945 to 2010; the organisation of the teaching staff over the centuries; the faculty of chemistry and earth sciences; and excursions of Heidelberg‘s geographers (co-authored). Based on his expertise and joy to generate and participate in fascinating academic debates, Peter created a very stimulating creative environment in Heidelberg that thrived through regular group lunches in the INF Mensa and became increasingly international. I remember well how he encouraged us to read widely, especially international and interdisciplinary academic literature, and involved us in frequent seminars on social theory with academics such as Nico Stehr and Benno Werlen in Oberflockenbach during the mid-1990s. 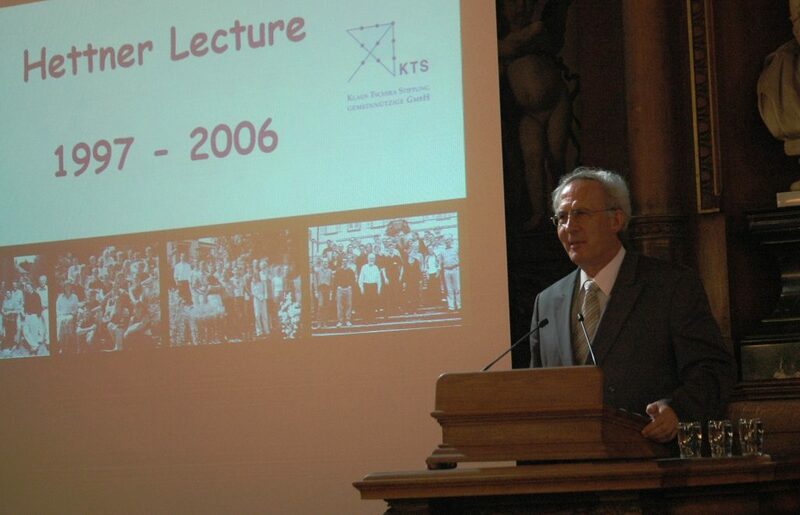 In the late 1990s and early 2000s, Peter hosted Humboldt and other visiting researchers from various countries, such as India, Hungary, Japan and the UK, and involved Tim and me (and Michael Hoyler) in his first long-term collaboration with the Klaus Tschira Foundation, namely the Hettner Lectures from 1997 to 2006, delivered by the renowned geographers Derek Gregory, Doreen Massey, Michael Watts, John Agnew, David Livingstone, Susan Hanson, Michael Storper, David Harvey, Denis Cosgrove and Mike Heffernan. Since the mid-2000s, Peter organised more than ten Knowledge & Space Symposia in the Studios of the Villa Bosch run by the Klaus Tschira Foundation, all of which have been attended by c. 15-25 researchers and academics from different countries, disciplines and career stages, and resulted in the edited volumes of the Knowledge & Space Book Series. In the week before he died, he read through the final draft of his co-authored book introduction for volume 12, Geographies of the University, and was content with the insight that this volume was ready to be published in 2018. There are not many academics around with whom I have collaborated for more than two decades, and Peter has not only shaped my research and teaching on the geographies of knowledge and education in important ways but also my career path, intellectual interests and personal networks that have eventually brought me to England. As a colleague remarked, our PhD supervisors are often like academic parents to us, and Peter clearly was a proper Doktorvater. Thank you for all your inspiration and support, Peter – I will miss your prompt emails and comments on publication drafts; conversing with you at conferences and over lunches in Heidelberg; and receiving those regular outputs that form your very impressive academic legacy! Meusburger, P. 1990. Die regionale und soziale Herkunft der Heidelberger Professoren zwischen 1850 und 1932. In: Meusburger, P. and Schmude, J. eds. Bildungsgeographische Arbeiten über Baden-Württemberg. Heidelberger Geographische Arbeiten 88, Heidelberg: Selbstverlag des Geographischen Instituts der Universitaet Heidelberg, pp. 187-239. Meusburger, P. and Schuch, T. 2010. From mediocrity and existential crisis to scientific excellence: Heidelberg University between 1803 and 1932. In: Meusburger, P., Livingstone, D.N. and Jöns, H. eds. Geographies of Science. Knowledge and Space 3, Dordrecht: Springer, pp. 57-93. Meusburger, P. and Schuch, T. eds. 2012. Wissenschaftsatlas of Heidelberg University: Spatio-Temporal Relations of Academic Knowledge Production. Knittlingen: Bibliotheca Palatina.